THE BEATLES: Today we went to Abbey Road and took photos of each other crossing the famous Beatles album cover crosswalk. At Sir Paul McCartney's (relatively modest) house we could see that his door was ajar and that he'd set up an easel in his front window. Jim recalled that Paul was a painter, too. Likely Paul was home this Sunday morning painting. Jim could’ve thrown a pastel chalk a few feet over the gate and hit Sir Paul with it. I should have yelled, "Paul, Paul, we love you. Come out and play with us! Or at least, come out and paint with us!" Later at the National Library, we saw original Beatles lyrics with changes and scratched out notes. Paul was neater than John, somehow not a surprise. The first draft of "Help" read, "And I WOULD appreciate you being 'round" instead of "And I DO appreciate you..."
After Windsor Castle, we walked to Eton College, which actually is a private high school where Princes William and Henry once attended. Of course that is 99% of the reason I had us go there. Pretty good tour, funny little tour guide. Jim liked it despite not sharing my royal fetish. The highlight of Westminster Abbey was getting asked for my student ID. Outside they assembled media scaffolding for the upcoming royal wedding. I was glad our trip preceded the chaos of the wedding itself. I conducted my own personal survey of English waiters and cabbies on various subjects, including royalty. The subjects themselves still miss Diana. “Diana was such a sympathetic person,” they recall with plaintive eyes. “Camilla’s a home-wrecker who should've left Charles alone! Camilla tries to copy Diana now, but can't pull it off.” I felt the Camilla hate. I waited for the ‘B’ word. TRANSPORTATION FUN: To get to Windsor, we made connections on commuter trains and the metro, all during rush hour. "Advanced travel," I told Jim. He got a little panicky a couple of times. "Do you know what you’re doing?" he asked, a hint of fear in his voice. We're learning to walk sidewalks and climb stairs on the left side. Jim suggested renting some of the bikes we see everywhere but I figure we could do a lot more damage making left/right mistakes while on wheels than on our heels. Jim keeps talking about a major street near our hotel called “DAY.” This puzzled me. Turns out he was thinking of "Wilton WAY" street. Makes perfect sense. Jim's out jogging now. I hope he finds his way back eventually. ENGLISH EATING: Pub food of fish and chips with "mushy peas" still reign. The slimy peas frighten me, but plated, they’re merely a morsel, a green condiment pile, no consumption required. And what we call “to-go” food at home they call “take away” here. Starbucks, popular in London, serves coffee in proper cups and saucers. Our hotel offers only instant decaf, but with every type of sugar and cream option possible. I've taken to adding cream and sugar to my tea, something I've never done before. I usually don’t even drink tea. Londoners pronounce the “h” in herbal tea, but I can’t go that far. ENGLISH LESSONS: Jim loves having language ability in Europe for a change. A professor at the British Library engaged Jim in conversation and Jim responded that he'd been having a "lovely time" in London. I can’t ever recall Jim using the word “lovely” that way. A gallery owner in Salem suggested we take the London Eye observation wheel, so we did. We found ourselves observing our English companions almost as much as the spectacular views. As we boarded our capsule, little boys flashed plastic swords, but they behaved once encapsulated. Mummy? one sword-bearer asked. Yes, Darling? Mummy answered. I heard my first real-life usage of cheeky buggard. Near the end of our ride, our Londoners sang Happy Birthday and He's a Jolly Good Fellow to a fellow passenger. They cracked jokes that Jim and I didn't understand. We pretended we got the joke and laughed along. INTERNATIONAL RELATIONS: We encounter French school groups everywhere. They must be on some sort of holiday. They are slightly obnoxious but I feel sorry for them when I see them eating their sad little sack lunches out on the pavement at noon while Jim and I waltz off to nice restaurants--a French restaurant today, in fact. Today we toured the Churchill Museum, a nicely preserved underground bunker where Churchill lived and ran World War II. The French didn't fare so well in WWII. Perhaps that's why we keep hearing anti-French comments and jokes. Nothing anti-American, thankfully. The museum explains that Churchill wooed Roosevelt like a mistress. Churchill had his first restful night’s sleep in ages after Pearl Harbor; he knew America would soon be joining fully in the war effort. We stumbled upon a movie film crew in the Courtauld Museum courtyard. The producers refused to tell us what they were filming. “A secret,” they answered. I asked a spectator. In faltering English, she responded that she was from Madrid. I told her in Spanish that I spoke a little of her language. She said they were filming for the X-Man movie series. Funny how my Spanish came in handy—in England. SEEING THE SITES: At the National Gallery of Art, Jim grew manic at the thought of his favorite Impressionist paintings, so I let him loose for a while to chase Cézannes. The Tate Modern Museum had a few gems on different floors. Again I sent art-frenzied Jim off to do his own bidding. Meeting up later, we'd both selected a Matisse as our favorite piece. Earlier we’d independently picked the same menu item for lunch. I guess this is what happens after over 28 years of marriage. The Tate had a few gems but a lot of bizarre moderny stuff. We decided to have a little fun and took snapshots of us interpreting some of the stranger pieces. Jim had no problem suggesting peculiar poses for me. He was less enthusiastic about participating himself, but I convinced him it was only fair. People stared; we didn't care. In Covent Garden, a string quartet of charming young women played classical music. They swayed to the rhythm, the viola player included. I waved to Jim and his camera, but the viola gal thought I was gesturing to her, and she waved back. In one motion, she played, swayed and waved. At St. Paul's Cathedral, we climbed the dome. If there's a dome, we climb it. I led our descent at a reasonable speed, or at least I thought so. Jim grew stressed as a group approached from behind. When they reached Jim, he scurried out of their way and dropped flat on his behind. Thankfully he's okay. Mama Mia was great fun last night, like a party. At first we privately mocked audience members who sang and danced to the music, but by the end, we'd joined them. Nearly everyone was bopping on their feet--except the older woman seated in front of me. In my Dancing Queen enthusiasm, my hand accidentally wacked her in the head a couple of times. I don't think she appreciated that very much. BRITISH YOUTH: We’ve experienced a pandemic of four year old girls on scooters barreling down the sidewalk, their parents unconcerned. On a quiet street near our hotel, one such creature aimed clearly for me. I tried to jump from her trajectory, but she was determined. Smack. "That was fun!" she reported to her daddy. We encountered more civilized youth at the Billy Elliot show last night. The lead was a thirteen year old phenom who could do it all--ballet, tap, sing, act. What a gorgeous kid. If I were a tween, you’d find his poster on my wall. Funny how this play is in Portland now, and I see that friends and family just saw it. Go Bill-y! CHUNNEL: First of all, they don't call it that anymore. Chunnel’s an old fashioned term, apparently. It's the Channel Tunnel now, and it was a real dark, quiet non-event of a ride under the English Channel. We went through a couple of other tunnels earlier in the journey and they weren't much different from the real deal. All in all, a great, easy ride. 1. I'd carefully rehearsed my grammatically-correct directions for our Parisian taxi driver. He said "Oui" and I prayed we were headed to the correct train station across town. Thankfully we were. Upon arrival, he cited a different amount from what the meter said, probably due to baggage fees. Now you must understand that the French word for the number eighty literally translates as four-twenties. Our cabbie quoted that four-twenty figure somewhere in his answer, probably in the cents category. Sadly all I caught was blah-French-blah-EIGHTY-blah-French-blah. I whispered to Jim just to hand the guy a twenty euro bill. Happily we got a bunch of change in return. 2. We'd been at our connecting train station in Paris only a clueless five minutes when a young gal from Santa Barbara approached and asked for advice. Jim proceeded to explain specifics of Paris' train system, of which he knew…absolutely nothing. He simply rehashed some of what he’d picked up in England. Jim spoke with such authority that the girl took notes, thanked him and went on her way. She may be still there. 3. Before boarding, we needed to stamp and validate our train tickets in the little yellow machines. Jim said he couldn't do this because he doesn't "do technical" stuff very well. Really, Mister Kaiser Dental computer consultant? I tried to stamp the tickets. French messages popped up which I correctly translated as "Return your ticket." I turned the tickets over to try again--nope. Front to back—Ka-Ching! Voila, we’d been stamped! Later my dictionary indicated that a minor translation for that “return” word was "turn over." A couple of months of French language review will take a person only so far. 4. We boarded the train and I tried to open up our window for some air. No go, they don't make this easy, so I gave it up. Our French cabin companion chuckled. Later I grabbed my French dictionary and looked up the words I’d seen printed on those windows: Emergency Exit. GIVERNY: Arriving at our Giverny hotel, the manager gave us the key for room number 23. We climbed two flights of stairs to discover a tiny attic room, different from what I'd reserved many months ago. The staff has limited English here, but I decided to bite the bullet and see what I could do about our room mix-up. The manager spoke a few words of English while I tossed out my limited French vocabulary, and I got her to understand our problem. She consulted some paperwork and I read a big OOPS on her face. She made a couple of excited calls and ran around the small hotel, asking me if I could wait while they cleaned our new room, number 11. Sure, I said, picturing Jim pacing in the attic, puzzled but too fearful of conflict and the French language to set foot outside the room and investigate. (He confirmed this later.) Eventually I summoned him to the lobby. The manager ushered us up the stairs toward room 11. We passed a cranky middle-aged couple on their way to our old attic room 23. It dawned on us that the management had ejected this couple from room 11 and made them trade with us. I said merci to the couple and got a sneer in return. I don’t know if the management made the switch because I'd booked room 11 over six months ago, or because they didn't want to deal with my English anymore. Honestly, I’d been very meek and undemanding throughout the whole process, but something tells me that the new residents of room 23 hold heightened anti-American sentiments tonight. After getting settled in our new room, it was time for some hotel dining. Fabulous, oh my. The banana chocolate crepe alone is worth blogging home about. We ordered elaborate multi-course meals, not so spendy out in the countryside. Our waiter requested our room numbers for billing purposes. Feeling suddenly and inexplicably confident, I answered in French. Given my earlier non-success with French numbers, Jim freaked a little. What if we were charging this meal to somebody else's room? he worried. I double-checked with my dictionary--all good--but still wonder if the original residents of room 11 will somehow get charged for it. The next day, we rested, read, slept, walked, ate, and did just of bit of tourist activity. The staff at our hotel is very sweet and we've not had any nasty encounters with the French folks we inadvertently bumped from their room. Jim says he hopes they think we’re British. MONET’S GARDENS: This morning we marched, as advised, straight-away to Monet's Garden's before the opening bell of 9:30. Not too many individuals waited out front with us, but buses of Japanese and Germans streamed in from the back gate--and this was the quiet time of day. The garden is smaller than we'd imagined, and not really that impressive as far as gardens go (Schreiner's in Keizer easily beats it, for example), but we enjoyed it as the inspiration for so many of Monet's paintings. Jim took a bunch of artsy garden photos with his monster camera and then we did our requisite silly poses with me. People seemed amused. At least we’ll probably make use of these snapshots in some way, unlike the thousands of random daffodil photos that the average non-artist visitor was taking. The Garden disappointed slightly, and our ticket wouldn't allow us to return for the better light of late day, but we still were glad to see it. The surrounding area was nicer than we'd hoped--quaint and undeveloped. They must have some serious restrictions for building and development. We could imagine commercial vendors salivating over the 1,000-2,000 visitors that herd through here each day otherwise. James lays next to me, snoring quite enthusiastically in this, his second nap of the day. I think the peace of the French countryside is doing us both some good. FRENCH FOOD: We're eating well here in Paris. Before our trip, I studied French words for our favorite foods, and now we hunt for them on menus. I’m fluent in chocolate, lemon, ice cream and strawberry tart. But I've realized it's also important to know which French terms to duck when ordering—words like duck--plus gizzards, raw hamburger and sardines. We don't want to make that mistake. Oddly enough, I believe we enjoyed better meals in London overall. And I don't think that had anything to do with language barriers. Jim can’t get over the number of cafes here and the numbers of people who fill them. Tonight we dined at a local-favorite in our neighborhood, a place which dates from 1845. Excellent food, but I believe the bathroom hadn’t been remodeled since its inception. It contained a single Turkish toilet out in a sketchy little courtyard; I decided to leave it to the boys. Other bathrooms here in Paris often have common sink areas with stalls for women and semi-open areas for men’s urinals behind half levered swinging doors. Think western saloon doors--doesn’t hide much. You see and hear the guys doing business from behind while you try to avert your eyes and ears. Ah, the French. At least they don’t allow smoking inside anymore. As of 2008, it’s all outside. Outdoor seating is more popular than ever for these Parisians who love their cigarettes. On a related note, French clerks and waiters aren’t so nasty after all. Of course, we’ve carefully followed the advice to constantly apply courtesies like Bonjour and Madame, so much so that it borders on obnoxious. But I do believe it’s helped. HOTEL FUN: Following a jog through Paris' streets, Jim braved our hotel's elevator for a ride to our 4th floor. The elevator lights flickered out again into complete blackness. Fortunately Jim had his jogging ipod at the ready and utilized it for temporary illumination in order to hit the appropriate keys on the wall. He informed the receptionist of this second power failure in the elevator, but the man simply answered, "I know." That was all. Jim wondered if it was some type of language problem. This is a pretty elegant and service-oriented hotel, after all...just not in the elevator, apparently. In Europe we've found that most hotels prefer that you leave your room key at the front desk as you venture out each day. When we return after site-seeing, I ask for our key by our room number, 42. Our receptionist probably recognizes that I've been trying to practice my language skills, and he teasingly makes me say the numbers in French. After a few times, I complained that Jim was getting off too easy, so now the receptionist makes Jim say 42 in French. Jim doesn't speak any French beyond Bonjour and Merci, so each time I have to stop and whisper the words into Jim's ear so he can say them. No key until we do this. Silly French folks. Returning to our hotel one afternoon with my hands filled with little pastry boxes, I asked Jim to fill out tomorrow’s room service breakfast request. Now I see why we accidentally got grapefruit juice a couple of days ago. The staff must have had trouble understanding Jim's completed form-- in ways that have nothing to do with English-French translation. Visualize a tangle of scrawls, scratches, and arrows pointing every which way. The receptionist looked at me and asked if I would like another form to fill out. I set my strawberry tarts on the desk and said, Oui, s'il vous plait, Madame. We should get orange juice tomorrow. FRENCH (MIS) COMMUNICATION: Here’s my French mangling of the day: At 3:30 PM, we returned for a break at our hotel for an hour's rest, but saw that our room hadn't been cleaned yet. I decided to tell the concerned-looking maid working next door that we planned to leave again at 4:30. But instead of saying we were leaving at 4:30, I actually told the maid we'd be leaving at “4-noon.” She looked puzzled, to put it mildly. At the Arc de Triomphe, I spotted a couple of bored-looking cops and flashed our magic museum passes, passes which (on paper) promised to jump us to the front of any ticket-purchasing lines for a climb to the top. The cops pointed to a nearby door where they’d posted a note in French. It said something about the climb being closed for now. I returned to the police, and in my best French, asked them when the climb might open. They responded in French something along the lines of, "TOMORROW blah blah NOT blah blah." Sometimes all you gotta know are a couple of key words. We snapped some photos and left. I’ve noticed that aside from the airport, all written instructions are in French only—except for notes on furniture in museums. Don’t sit here! Don’t touch! We finally made it to the Marmottan, another Monet museum on the outskirts of Paris, and this time it actually was open. Afterwards we stopped for a café au lait near the museum. I used my bad French to order. As usual, I had trouble understanding their follow-up questions. I switched to English for a moment. An elegant madame nearby stopped, smiled, and told me in French that I was doing just fine and should keep trying. Later I struggled while ordering macaroons in a bakery and apologized for my lack of language ability. The clerk there answered that I was suffisant --sufficient, good enough. These comments alone made my many hours of French review worth the effort. FRENCH UNDERGROUND: The Paris metro has artistic signage not only at its entrances; it has art and decor specific to its stops down on the platforms. The Rodin Museum stop, for example, has copies of his more famous works. The Sorbonne stop has elegant writing and script on the walls. The stop near where Marie Antoinette was imprisoned and executed was dark and scary, but we believe that was mere coincidence. Several times we've encountered musicians on our metro cars playing accordions, saxophones, xylophones and kazoos. I may not understand the language very well, but we recognize and enjoy the tunes down there. We slipped one musician a coin in order to snap his photo. FRENCH CULTURE: Parisian couples do PDA (that's Public Displays of Affection, Mom) like the Spanish couples Annie and I observed making out in public spaces of Madrid. Mostly Parisians Publicly Display in the parks, but we also spotted some passion in the train returning from Versailles. After one particularly affectionate exhibition, a guy sitting across from the offending (French)-kissing couple jumped to his feet and changed seats. Later as we exited the metro, a well-groomed elderly pair on the corner kissed and then kissed some more. I thought for sure they were saying goodbye, but when I glanced back at them, they were holding hands and meandering down the street. Today was one of my favorite days of our trip so far. Probably that's because we had no trains to catch or specific sites to see. 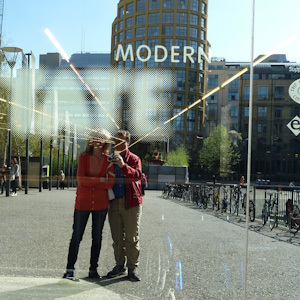 Instead we explored old Left Bank streets and neighborhoods and watched Parisian families out enjoying this beautiful warm April day in their cafes and parks. SO many people out in the parks. In the huge Luxembourg Garden near our hotel, Parisians lounged in the many green metal chairs scattered about, reading books, soaking in the sun, chatting, making out... My guess is that people utilize these lush open spaces more than we do because they don't have anything like it in their tiny apartments. In Luxembourg Garden, visitors can partake in certain activities only in appropriate sections of the park. Be prepared to research the correct place to jog, play cards, walk your dog, play chess, or listen to music. Everything in its proper Parisian place. But I didn’t see a make-out section. On the fashion front, I thought I was being all French chic wearing my new toothpick-skinny jeans that Annie helped me select recently. But no, they are commonplace here. EVERYONE wears them. Even middle-aged daddies wear them. I would look weird if I weren’t wearing them. VERSAILLES: Today we toured Versailles, which was great, but the day started off shaky. I'm fine with navigation here--except in our immediate neighborhood, specifically to and from our metro station. I must stop paying attention, either from fatigue or familiarity, when in the vicinity of our hotel. A mistake. This morning I wound us around odd places, lost on our way to the train connection to Versailles. Conversely, Jim usually has no idea where we are--except in our immediate neighborhood. He knew that we were off-course but figured I must have had some other plan so he said nothing and just followed along as usual. Eventually we reached the train station which would deliver us on our 45-minute journey to Versailles. After a bit of trouble locating the ticket office, we encountered an agent who spoke no English. Somehow my sad French plus some pointing and sign language succeeded and we made the correct train. Versailles itself is immense, with tons of people to fill it. Out front the massive parking has spots for countless buses. Those tour groups ended up being a real pain inside the Chateau. Group upon group of Japanese tourists jammed passageways, blocking everyone to a standstill multiple times. Individuals of all nationalities did their best to gum up the works in other ways; if there were a small exit, somebody would invariably enter, stop, and study their map. We were much happier once we left the Chateau. The groups disappeared, probably on a bus bound for the Eiffel Tower, Notre Dame and the Louvre—all in the same afternoon. The smaller palaces on the grounds were pretty grand in their own right. Marie Antoinette's recreated Austrian hamlet was adorable. 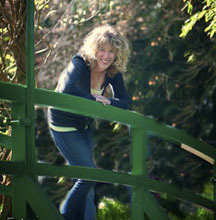 We connected more with Marie on the grounds than in her popular, people-packed Chateau bedroom. OTHER FRENCHIFIED SITES: We toured Napoleon's tomb and the WWI and II museums, where we learned that it was actually France's Charles de Gaulle and his resistance fighters who'd won the war. Who knew? Across the street from the war museum stood the Rodin sculpture mansion. Rodin kept multiple female models on retainer to prance around his house naked in hopes of capturing an interesting pose. One of resulting sculptures is described as an "open" posture, and yes, that it was. Upstairs we stumbled upon some miscellaneous paintings by Rodin friends—such as Monet, Renoir, and van Gogh— almost an afterthought here. I'm tired and my legs feel like Jello, which makes sense given that Jim and I just climbed the 400 steps inside Notre Dame. Great views, great gargoyles, great wooden Gothic bell tower. All quite medieval, dark and scary. Easy to imagine the Hunchback in there. We never found Quasimodo, but we did bump into somebody nearly as bizarre near the bell: a portly French matron, perched in a plastic-enclosed alcove. She made twirping noises. Did the cathedral hire her to commune with the pigeons? We all found her a little freakish and wondered how she hauled herself up there in every day. Or maybe...she never leaves!? Back on our Cézanne hunt, we toured Paris’ Orangerie, a smaller Impressionist museum with multiples of Jim’s much-loved master. We favor these smaller, more modern, less crowded galleries, where you actually see and enjoy each painting. Jim started hyperventilating upon entering, so I sent him on his happy way for an hour or so. The Louvre, which followed, was the exact opposite of the Orangerie. First of all, we got utterly lost. Despite being a supposedly quieter time, there were still plenty of visitors. It was warm inside. We were tired. All in all, not as enjoyable, but we did like seeing the Mona Lisa, Winged Victory, Venus de Milo, Michelangelo's Slaves, and de Vinci’s Virgin of the Rocks. ARTIST JAMES: In art museums, I keep seeing the same French descriptive on certain paintings: "Nature Mort." I looked it up. Turns out it means "Dead Nature." It took me a while to understand that was the French term for "Still Life." Jim's gotten inspired to do some of his own artwork here in Paris. He discovered an art store down the street from our hotel (we are, after all, in the Sorbonne neighborhood, where even the beggars read books while pan-handling) and has completed three lovely little pieces so far. This evening James hauled his art supplies down to the River Seine. Notre Dame loomed as a backdrop. He set up his oils and canvas on the bridge like an artist of old, and he began painting. I stood a few yards away with a camera to record the event, beyond obvious detection of folks passing by. Nobody seemed to notice Artist James. As per our plan, I pulled out the charcoal beret we’d purchased at a souvenir stand that morning and popped it on Jim’s head. Suddenly, magically, James transformed into an authentic Parisian artist. Artist James became Artiste Jacques. 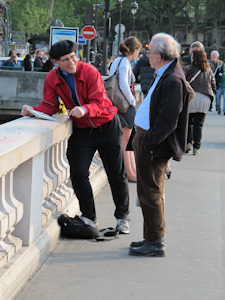 Immediately Parisians stopped to chat with the French artist on the Seine. They assumed Jacques was one of them. What was he painting? What materials was he using? They rambled in fluent French, confident he would understand everything. Apparently nobody but an actual Parisian would dare don a beret and paint on a bridge. I guess I didn’t really need to study French, after all. All I needed to do was wear a beret. Remember that on your next trip to France.